DAVID A. PATTERSON (University of California at Berkeley) has taught computer architecture since joining the faculty in 1977, and is holder of the E.H. and M.E. Pardee Chair of Computer Science. At Berkeley, he led the design and implementation of RISC I, likely the first VLSI Reduced Instruction Set Computer. This research became the foundation of the SPARC architecture, currently used by Fujitsu, Sun Microsystems, and others. (In 1996 Microprocessor Report and COMDEX named SPARC as one of the most significant microprocessors as part of the celebration of the 25th anniversary of the microprocessor.) He was also a leader of the Redundant Arrays of Inexpensive Disks (RAID) project, which led to reliable storage systems from many companies. These projects led to three distinguished dissertation awards from the Association for Computing Machinery (ACM). He was also involved in the Network of Workstations (NOW) project, which led to multitier architectures used by Internet companies such as Inktomi. His current research interests are in the parallel computing revolution using via the Parallel Computing Laboratory (Par Lab) and using the Research Accelerator for Multiple Processors (RAMP) and in Reliable Adaptive Distributed systems in the RAD Lab. He is also co-author of five books, including two with John Hennessy, President of Stanford University. He is a member of both the National Academy of Engineering and the National Academy of Sciences, is a Fellow of the Computer Society of the Institute of Electrical and Electronic Engineers (IEEE), and is also a Fellow of the ACM. He received the inaugural Outstanding Alumnus Award of the UCLA Computer Science Department as part of its 25th Anniversary; he received his A.B., M.S., and Ph.D degrees all from UCLA. In 1995 he received the IEEE Technical Achievement Award. In 1998 he shared the inaugural Test of Time Award with Garth Gibson and Randy Katz, given by the Special Interest Group on Management of Data (SIGMOD) to the most influential paper from the SIGMOD proceedings 10 years earlier. The following year they also shared the IEEE Reynold B. Johnson Information Storage Award "for the development of Redundant Arrays of Inexpensive Disks (RAID)." In 2000 he shared the IEEE John von Neumann Medal with John Hennessy "for creating a revolution in computer architecture through their exploration, populartization, and commercialization of architectural innovations." In 2005 he shared Japan's Computer & Communication award with Hennessy, was named to the Silicon Valley Engineering Hall of Fame, and received a Certificate of Congressional Recognition from Congressman Michael Honda. In 2006 he was elected to the American Academy of Arts and Sciences and the inaugural Katayanagi Prize from CMU. In 2007 he was named a Fellow of the Computer History Museum and a Fellow of the American Association for the Advancement of Science. 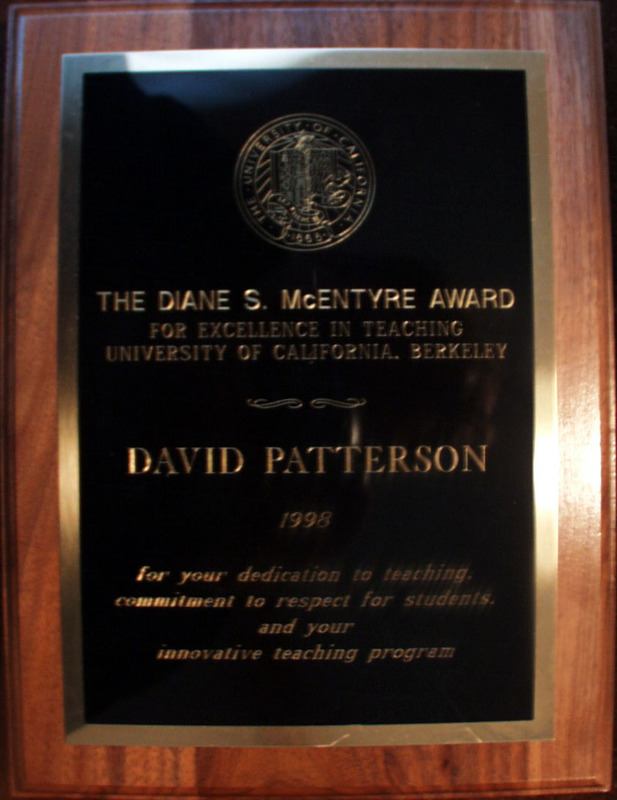 His teaching has been honored by his department in 1998 with the Diane S. McEntyre Award for Excellence in Teaching, by the University of California in 1982 with the Distinguished Teaching Award, by Upsilon Pi Epsilon honor scoiety with the Abacus Award in 2006, by ACM in 1991 with the Karl V. Karlstrom Outstanding Educator Award, by IEEE in 1996 with the Undergraduate Teaching Award, and by IEEE again in 2000 with the James H. Mulligan, Jr. Education Medal "for inspirational teaching through the development of creative curricula and teaching methodology, for important textbooks, and for effective integration of education and research missions." He has been chair of the CS Division in the EECS department at Berkeley, the ACM Special Interest Group in Computer Architecture (SIGARCH), and the Computing Research Association (CRA). He was also elected President of ACM for 2004 to 2006. He was a member of the National Academy of Sciences Computer Science and Telecommunications Board and the CRA Board. He has consulted for several companies, including Digital (now HP), Hewlett Packard, Intel, Microsoft, and Sun Microsystems, and is on the technical advisory board of several companies. On the personal side, David married his high-school sweetheart in 1967. She is an award-winning teacher of acting improvisation, is founder of EAST BAY IMpRoV, and her watercolors have sold in local stores. (An interview with her appeared in the Santa Cruz Sentinel.) Their first son got a Masters degree in Economics and is now a network administrator near Berkeley, and he lives with his wife and child near Berkeley. He is founder and director of EAST BAY IMpRoV Players. (A review of an EBI show appeared in Urban View.) Their second son got a Master's degree in social and decision sciences, and is now at Adobe systems. His second son lives with his wife and two children near Berkeley.